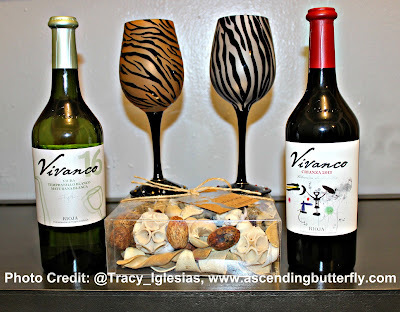 You know I am never quite capable of going completely Wordless on Wordless Wednesday, so I thought today I would come strong with a Wine Wednesday sponsored by Vivanco Wines and let YOU play Sommelier. Which wine would YOU select? The Vivanco Viura Tempranillo Blanco Maturana Blanca Rioja - (Much like me) Tempranillo, thrive with cool nights and slow ripening. Pale-yellow with green hues; clean and bright. Expressive, intense and complex (again much like me!) with aromas of citrus fruit, green apples and white peaches, underscored by elegant floral hints. Above: Left: Vivanco Viura Tempranillo Blanco Maturana Blanca Rioja and Right: Vivanco Crianza 2013 Rioja - Don't you just love my bling-blingy Wine Glasses? I hope someday soon to be able to take a tour of the vineyards and do a tasting as well as visit The Vivanco Cultural Museum! The Museum houses modern and functional collections that the family has acquired over the years. The collection includes everything from wine labels, to tools, manifestos and fine works of art by masters like Juan Gris and Pablo Picasso. The museum is an enterprising and ambitious initiative, and has become an international point of reference about wine, its history, production techniques, research and all cultural and artistic events that revolve around it. The weather here in New York City has been sweltering! A nice glass of wine and a spot under the Air Conditioner where I can write in peace sounds perfect for Wine Wednesday! So tell me butterfly which wine would you select the red or the white, and what would you pair it with? FTC Disclosure: Wines were provided to Ascending Butterfly for Editorial Consideration, and all opinions are 100% my own! I am disclosing this in accordance with the Federal Trade Commission 16 CFR, Part 255 - Guides Concerning the use of endorsements and testimonials in advertising, you may check our Giveaway and Disclosure Page for additional information regarding Ascending Butterfly Disclosure. @Masshole Mommy Do you have a favorite red? I have no idea how to pick wine. I always just follow the recommendations of another more winely person than I. So far, it's been working for me. Wine me!! I love wine...usually my treat at the end of the day. My favorite is a nice Merlot. Thanks for sharing your thoughts today. I hope to go to a vineyard soon. CHEERS!! @Censie You definitely need to hit a vineyard! Such a fun girls night out! Great information! I do not drink, but I love to gift good wines to my fancy brother. I guess this is his gift for this Father's Day visit! Thanks! @GayNYCDad Glad I come through for your brother's Dad's Day gift, also check out the Mavrud's I featured on this post: http://www.ascendingbutterfly.com/2017/05/winewednesday-euwinetreasures-bulgarian.html <-They really taste like a million without breaking the bank which is great! I love your wine glasses. I am not a red wine fan so I would definitely choose the white wine. @Pam - They are part of a set of four, I have featured some of the others in the set already, they were a gift from the Wildlife Conservation Society - aka Bronx Zoo to celebrate my Ambassadorship, I treasure them and love them SO much more because of that! It would be so much fun to take a tour of a vineyard! I am a red wine girl myself. @Kelly H - Do you have a favorite Red brand you recommend? I am still expanding my palate when it comes to reds! I've no experience with wine. I have tried it but it's not my drink of choice. I'd love to learn more about it though! That's a lovely selection. I've never tried this brand before but I would love to. I usually prefer red over white wine. @Amanda L - Do you have a favorite brand when it comes to reds? I am still trying to expand my palate and don't think I have find my all time favorite with red like I have with my sparkling, which I can easily name my top three. I am a big fan of cab sauv so red wine is my thing and I would choose the red. I love then bottles and label on these, so pretty! @Thirty - So funny, I thought it was just me, as a former Graphic Designer I totally notice the label design too! I think I would choose the red wine and pair it with cheese. It would, of course, be sent to my sister-in-law's house as a 'just because' gift. She would really enjoy that. I am a wine girl for sure. I am a red wine drinker definitely. Trying to research better on wine pairings. @Emily - I love a good Rose as well as Moscato, sometimes you just want something chilled and sweet. A Winery visit is such a fun place to learn about how the wines are made and have a really informative tasting. I don't really like red wines alone or with food. When dining in restaurants, I always go for wines with those aromas and notes you mentioned: citrus fruit, green apples, and peaches. Rose is also okay for taste. R - Sounds like a good Chardonnay or Sauvignon Blanc is right up your alley. Do you like Moscato? I am not much of a wine drinker at all. If I do drink wine, I like a Riesling. @Dan - Great choice, I love a good Riesling, they pair quite well with Seafood which I love! I am a huge wine lover. For summer, I love a nice rose. I usually go for the whites over the reds, but I'll take wine in any form! I'd also love to tour the vineyards. It would be a splendid way to spend an afternoon. Cute glasses. I have a real love for red wines. I enjoy finding a tasting new varieties too. I am currently hooked on a semi sweet red that goes with everything. Please share the name of your fave semi sweet, I would love to try it! @Jeanine Nothing wrong with a nice glass of wine to unwind every now and then! Me too, I prefer White Wine to Red as well. I don't drink alcohol so I have no clue how to pick. I would be terrible at it! @S. Do you not drink at all, or just don't drink wine? Looks like you have some great wine selections here. I know that I have always loved being a part of a wine club and tasting all kinds of different flavors. Although Reds and me are a dangerous combination. Lol. Ah well. I'm not sure, but I think I would pick the white wine. Sounds like a yummy wine though! I am more of a red wine type of person. This sounds so awesome. @Becca This one was great, and I also highly recommend the Mavruds featured in this post: http://www.ascendingbutterfly.com/2017/05/winewednesday-euwinetreasures-bulgarian.html <-They really taste like a million without breaking the bank which is great! And they paired so well with the meal featured too. When I am doing the hostess role, I usually serve red wine and pair it with a platter of delicious cheeses. I would love to try Vivanca wines too! Wow this is super great! we like to serve our red wine with cheese and fruits. @Mamacita - That's a great combo. Another delightful combo is bourbon and chocolate, but that is post for another day! I will always choose red over white wine. It just goes well with meats and cheese. @Eileen - Do you have a specific red you prefer? I'm always looking for recos! I started out liking white wine exclusively, but I'm growing to like both kinds although I do tend to prefer white in the summer. So I'll have to choose a bottle of each! @Liz - For me it was Sparkling first, but yes definitely mostly whites, my palate is expanding, I would definitely say a bottle of each so you have each guest covered.